I've mentioned before that I started this blog with Absolutely.No.Idea about what blogging actually was, and how to go about it. I just jumped in and started typing away and learned the basics as I went along. I've never tried to turn it into a money making enterprise or a soapbox to vent from, it's just been a wonderful outlet for me and a fantastic way to meet and connect with people all over the world. I'm a latecomer to the blogging party - some people I've "met" have been blogging for a decade or more. I am in sheer awe of their tenacity and adaptability, and the way they keep up with all the changes that have happened in that time. I've only been kicking around the edges for the last two and half years - but let me say this - "it's been brilliant!" When I was in high school I loved English and writing essays. I loved expressing myself in what I wrote, and it was a lot easier to write my thoughts down than it was to stand up and state them aloud. The thing is, high school ended, I went into the field of dentistry where no creative outlet was required, and my writing stopped dead in its tracks. When I was a mum I didn't know anyone who wrote anything either - Mommy Bloggers were a complete unknown in my world - probably because the internet wasn't invented and when it finally arrived, it was something our kids used at dial-up speed and it held very little attraction for me. Fast forward to my fifties and I suddenly felt the compulsion to write again. Not the little bits and pieces I wrote in my journal, that was more about record keeping. No, I wanted to write what was in my head. I wanted to put down some of the stuff that floated in and out and to make it real. I wanted to write about what had been happening in my life and use that to figure out where I wanted to go. This is where I jumped online, found the first free blogging site I came across, signed in, and started typing. I don't think I've stopped since! When I'm not typing, I'm thinking about what I'd like to type. Sometimes I wonder what will happen when I run out of words, but that hasn't transpired yet. I've thought about all the different directions I could go in with blogging, but I keep circling back to my original reason for doing this - I just love to write. Because I don't need to make money from my blog, I'm not compelled to write about anything other than what interests me. I'm not driven by how many views I get (although I love people reading what I write) and I don't have an agenda, other than having fun. There is no pressure to compete with others, there is no pressure to perform at a certain level, it's all on my terms and it fits in so well with my life. I've learned so much about writing online, I've learned about a lot of stuff I'll never use - but if you don't know then how do you decide what works and what doesn't? 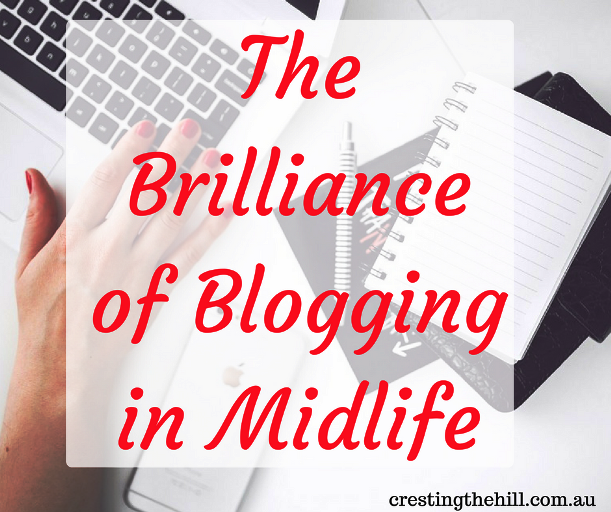 I love reading other blogs and getting to know other bloggers. The camaraderie I've found, and the generosity of other bloggers never ceases to amaze me. A whole world has been opened up to me over the last couple of years and I'm so glad I found it. I have friends who wonder if they should blog and my advice would be - go for it! I have others who wonder how I find stuff to write about and I think that if they need to ask then maybe blogging isn't their "thing". All I know is that I've discovered this wonderful outlet and it's brilliant! It has taught me so much, it has allowed me to discover myself and to express those discoveries. It has validated a lot of my journey because I've connected with so many other people who are travelling the same road. If you've never written a blog and you wonder what it would be like, all I can say is - go for it! Start somewhere free - you can always change it up and spend the bucks if you feel like it has a future. I'm a very frugal person, so spending money on something takes a fair amount of consideration. I love the fact that I can do all this for next to nothing - on my own terms, in my own time, and still reap such huge rewards. I'm so glad I stumbled upon this "blogging thing" because it's been one of the biggest blessings to come my way. 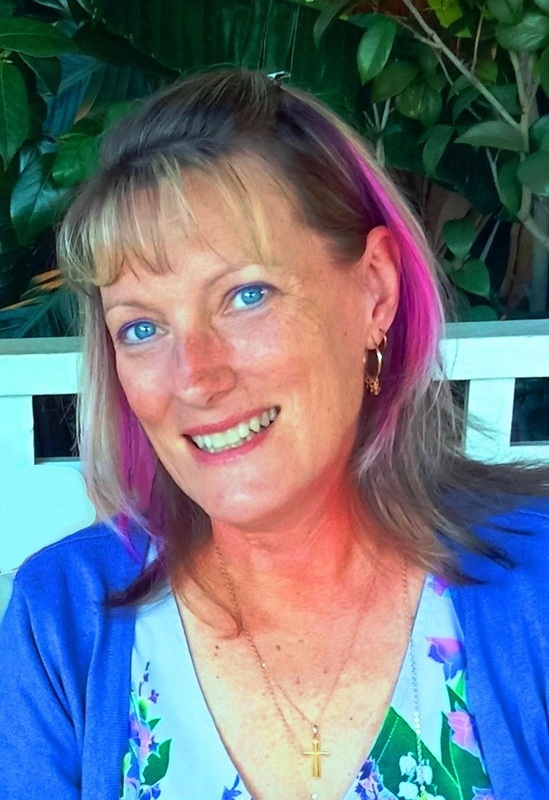 Hi Leane, Terri Webster Schrandt here from Second Wind Leisure. Our writing took a similar path, although I did a lot of freelance editing (not much of my own writing) while I worked my full-time career in recreation and parks. Right after I retired over 2 years ago, I dusted off my "professional development" blog I started on wordpress and started blogging, yes, for fun...a hobby! It has been THEE best experience ever! Hi Leanne if we hadn't started blogging Leanne we would never have met! I've never written although I did like writing essays at school. My work was Administrative and Accounting so not much call for writing prose there! I still waiver between should I blog for fun or more but when I look at all the courses and what is involved my head spins. I think enjoyment first and as you say you can write what you want and if others like that is a bonus. Have a great week! Meeting you has been one of the biggest blessings along the way Sue - we're like sisters from another life :) And I know what you mean about vacillating between monetizing or not - I think I'll stay away from selling my soul for a bit longer - I love the freedom of being unaccountable to anyone but myself. I am so with you! I just love to write and I enjoying blogging very much. I sometimes question what direction my blog should go in, and then I just stop fretting and get back to enjoying it. Have a great week! I am writing this on a Sunday from the USA. Kansas to be exact. I am smack dab in the middle of the USA. Hello from Australia to the middle of the US! And I know what you mean about choosing a direction - there is so much advice out there about stuff but I now follow my heart and I figure authenticity is what we all look for in other bloggers - and that's all we need to offer. I started later than you, in my sixties, and I think it's one of the best things I have ever done. Creativity, engagement - what's not to love. I don't think it matters when you start - it's just about being so glad you actually took the plunge - it's so much fun isn't it? I love your blog Denyse - and your link ups. I think we all go down the rabbit hole of wondering if we want to blog for money. I found it was all too hard and I had a lot more fun just doing my own thing. Maybe one day the siren call of monetizing will get to me but for now it's all about connection and being true to myself. 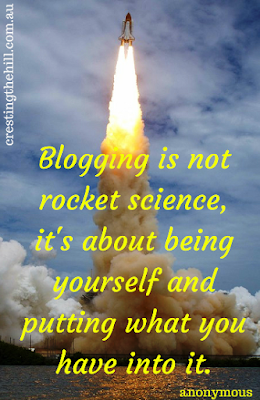 It sounds like you are blogging and writing for all the best reasons possible! All the very best reasons to write. And so happy that you share it with us! I know without blogging and reading other blogs I would never meet people like you who live on the other side of the world. Blogging makes the world that much smaller and closer and kinder because who's going to read blogs from people you discover you don't like! Perfectly said Haralee - I love all the connections and cyber friendships all over the world. It makes everyone feel so close and it's strange to think I'll never meet all these "girls" I've come to know so well. I started blogging because as a disabled full time caregiver I was so isolated that I just need human contact. I've met so many wonderful people and can't imagine my life without it. It's even been the stepping stone for a whole new career. I love what you've done to turn your blog into a business Rena - you were one of the first blogging friends I made and I have followed your journey all the way - well done for completely reinventing yourself and being an inspiration to the rest of us! You are a long way from home! Thanks so much for stopping by and yes you are absolutely right - who wouldn't blog once they caught the blogging bug? Hehe, that's my excuse anyway! Even if no one read I think I'd still blog. It's such an amazing community isn't it Renee. I can't believe I was completely unaware of it for so long. I love how interconnected everyone is and how supportive. And altho I try not to focus on the number of views, it is lovely to think that other people read what I right - and especially those who leave a comment! Starting a blog is one of the best things I've ever done! I love the friendships I've made, and it definitely keeps me on my toes! I love blogging too :-) . As a teenager I got into penpalling big time, a habit that continued til after I was married and the kids arrived. I'm still in touch with some of those penpals only today, it's via Facebook! How lovely to think that those friendships have lasted all those years Janet - it's like our blogging friendships isn't it - physically distant but mentally and emotionally close. One thing I like about blogging is all the friends (like you) that I'm meeting all over the world :) Thank you Leanne for sharing this post at the Wednesday AIM Link Party at Grammy’s Grid. I shared it on social media. Hope you get lots of traffic! I love the friendships too Dee - all these lovely people I've met and connected with - it has made my 50's especially lovely. Hi, Leanne - By changing just a couple of details, this post describes my approach to blogging completely. I began blogging 13 months ago -- no real idea why I was doing this, or how to do it. After publishing my first post, I was totally hooked. My learning curve is still very steep. I do have a random question for you. I notice that you've used CommentLuv. I tried this comment feature and loved it. My concern is that readers said that they did not receive an email notice when I replied to their comments. Do you know how to correct this? I look forward to following your blog further. Thanks, Leanne - This is reassuring and very helpful! I'm another one who just wings it. There's a freedom that comes from being able to express whatever you want, whenever you want &, whatever your blogging style, there WILL be people who will appreciate it. I call other bloggers my 'friends', because even having never met them I know that we have similarities that draw us & sometimes bind us. I really hate the advertising on some blogs & (I may be missing out on some great stuff, but) I usually don't bother to stop by them again. I especially dislike the ads that keep popping up after you've closed them once or videos about crap I didn't go looking for that keep playing randomly. Oh Mrs Shoes! You and I are kindred spirits (to quote Anne of Green Gables - that I am currently reading) I hate those pop up ads vehemently and it has to be a pretty fantastic post to get me to stay there clicking crosses and trying to get rid of all the "please follow me" or "buy this stuff" ads. I love the freedom of just doing it for fun and not playing the advertising game. Like everyone else, I love to write, but it was in my late 50's that I felt writing needed to be more than journalling and less than books. I publish my posts because of a graphic impulse to. It's helping put the puzzle of midlife together one piece at a time. 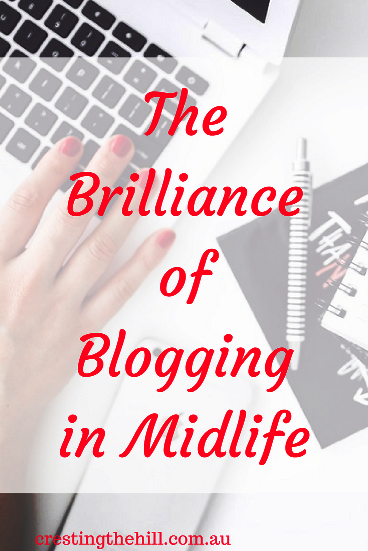 I'm much the same Beth - blogging has been an epiphany to me and certainly allowed me to get my head around midlife in a way that nothing else has. Journalling for me is more personal - I tend to jot down the everyday stuff that isn't of any blogworthy note. My husband doesn't totally understand why I blog. My children were thrilled and very proud when I started blogging. Thanks for linking up with Blogging Grandmothers. My family didn't get it either Candace - they are now quite accepting of it but I don't think anyone I know really understands the pull of blogging - it must be something you get addicted to once you jump in! I totally get it. I continue to blog because I simply cannot quite. Thank you for sharing with #blogginggrandmotherslinkparty. #linkparty, #party. I have shared on social media. I'm a bit the same Clearissa - I tell myself I'm going to give it up and then off I go down the rabbit hole again and before I know it another 6 months has zoomed by! Thanks Leanne, I have learned so much about attitude from you. Keep up the productive blogging we love you.